The producers and stars of "Supergirl," including Melissa Benoist and Calista Flockhart, explain what inspires the modern superhero and what viewers can expect from the highly-anticipated CBS show. 'Supergirl' is an action-adventure drama based on the DC Comics character Kara Zor-El, Superman’s (Kal-El) cousin who, after 12 years of keeping her powers a secret on Earth, decides to finally embrace her superhuman abilities and be the hero she was always meant to be. 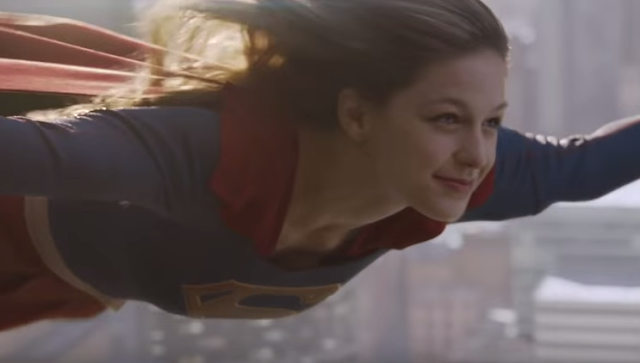 Twelve-year-old Kara escaped the doomed planet Krypton with her parents’ help at the same time as the infant Kal-El. Protected and raised on Earth by her foster family, the Danvers, Kara grew up in the shadow of her foster sister, Alex, and learned to conceal the phenomenal powers she shares with her famous cousin in order to keep her identity a secret. 'Supergirl' will premiere on Monday, October 26 at a special time (8:30-9:30pm) before it moves to its regular time slot on Monday, November 2 from 8:00-9:00 pm.